As promised, in this issue â€“ and the following issues â€“ I will now write a little more about some of the favorite slots that my readers have told me they like to play, and also show you some of the great new slots that are now available in your favorite casino. In this issue, I present Zorroâ„¢ Hyperlink Progressive, by Aristocrat, and a short description of the game and how to play it. Riches from Behind the Mask! Cut yourself a swath of rich winnings from this great multi-line slot machine from Aristocrat! When I was a little boy I remember TV and movie serials featuring the great Mask of Zorro â€“ the hero who always won the day and rescued the fair maiden from the clutches of the terrible terror! And, as he was leaving, he would carve the Big Z into the hide of the villain! Ahh, what thrills they were in those days of youth! Today, the legend lives on in a penny denomination video slot machine game from one of the most innovative companies in the world, Aristocrat. Originating in Australia, these innovative video games have begun to be called â€œAustralian-style slotsâ€ in the industry. And for good reason. With innovations like this, itâ€™s no wonder that they are popular with players everywhere, including here in the USA, and in the casinos of the Midwest. Even Las Vegas has many of these games, and the progressive hits very, very often. I have played this game myself, and it is truly great fun. 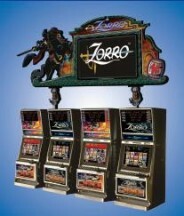 The Zorroâ„¢ machine is a progressive that has a four-level jackpot, with six bonuses, and four bonus features. The four-level second-screen progressive includes three linked progressive jackpots and a fourth top jackpot with a fixed $50,000 payout, which can be won on any game. All of these jackpots are triggered randomly, and the jackpot level won depends on the accumulated jackpot score you gain by choosing the various symbols. And when you make it into the second-screen feature, you are then guaranteed to win one of the four jackpots. This means that the wins happen very frequently, and you therefore have a great chance of making a good score. You also have a choice of betting an extra 10-credit ante bet. This â€œbuy-a-payâ€ feature adds more winning opportunities by giving you the chance to win one of the Zorroâ„¢ random bonus awards. You win your way into this bonus round when the letters Z-O-R-R-O are spelled across all the reels â€“ and they do not have to be lined up on any one line. This Zorroâ„¢ bonus feature gives you free credits, free games, you choice of options, a match-a-coin feature, as well as bonus multipliers. Zorroâ„¢ and Zorro Unmaskedâ„¢ are two of the featured base games currently offered. Like Aristocratâ€™s other Hyperlink products, Zorroâ„¢ is offered in a complete package that includes themed chairs and bases and visually-stunning signage. The large LCD display also enhances floor presence by celebrating wins and playing full-color story animations of Zorroâ€™sâ„¢ good deeds and achievements. The Zorroâ„¢ Hyperlink is available in most tribal and riverboat casinos in the United States, as well as in Las Vegas, and other gaming destinations in major casino centers. By the way â€“ â€œThe Legend of Zorroâ€ began when author Johnston McCulley first introduced the character in his serialized story â€œThe Curse of Capistrano.â€ The first movie based on the character of Zorro was â€œThe Mark of Zorroâ€, a silent film made in 1920. It proved so popular that one version or another of the story has been filmed for movies or TV ever since, and, well, the rest of the legend and fame of Zorro is history. Now this famed â€œmasked manâ€ hero is bringing his swashbuckling adventures to great new video slots by Aristocrat. I will write more about this game â€“ and the world of the great new slots â€“ in future issues. Special Note to Readers of this column.